Spring has most definitely sprung, and with it my new blog is up and running. My main aim in writing this is to remind myself where I've been and what I've been up to - my memory was never up to much even at its best! I escaped gardening duty this afternoon to get in a couple of hours rambling around Puttenham Common and the surrounding area. It was surprisingly quiet - maybe because it was so hot - and I had the place pretty much to myself. The rabbits were out in force, as were the flowers. 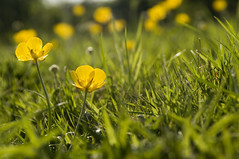 I found these fine specimens of buttercup in a field just outside Puttenham village, snapped from ground level in a poorly disguised attempt at slacking off from the walk.